For my compact 40 metres transceiver there was not plenty of space for complicated circuits. So I had to find a simple but effective solution for the singe stages. Everybody knows that the first stage in the receiver’s front with the 1st mixer, which is a crucial one, determins the overall performance of the whole receiver to a wide extent. So, which mixer should I use? Among the “standard” mixers available on the market there is one, that uses only a few external components as a mixer stage that, aside from mixing two signal, delivers a recognizable amount of gain (around 18 dBs): The well-known NE612 (aka “SA602” and other derivates). For extreme receiving situations with excessive out-of-band signals there is a 10dB attenuator switchable from the front panel. As I found out this is only required if you use an antenna that delivers high rf voltages in the evening from broadcast stations transmitting above 7.200 kHz (like my Deltaloop does). With my vertical antenna using the attenuator on the other hand is obsolete. After the attenuator you can see a three-pole filter made of tuned circuits with a center frequency of about 7.100 kHz. The trick is the loose coupling between the single tuned circuits. This makes the filter extremely sharp but costs you some gain. To compensate the loss, the following stage equipped with an NPN-transistor is used. Noise figure enhancement is not the problem on 40 meters, so I did not use a FET. A bipolar transistor fills the needs. After that another 2 tuned circuits, also extremely loosely coupled, follow. Next is the well-known SA602 mixer IC powered with the input signal from the 7MHz filtes and the DDS VFO.The input to PIN 1 and 2 of the mixer IC is symmetical which is preferably to the single ended unbalanced method seen in many other circuits. You can see the antenna input from the right, an on/off switch from top (not in schematic) and the output to the 1st mixer also on the right (connected to the reverse side of the PCB). Hello Peter, I’m Claus PY3CL from Brazil. Could you please give me some more details how to build the filters tuned circuits? 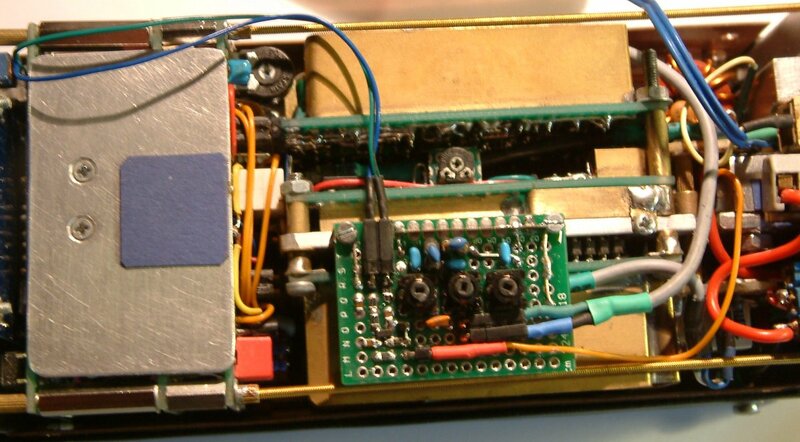 I would like to build this front end for my QRP rig, I found your project very interesting. Thanks a lot. thanks for your entry to my blogsite. Here is some information about the filters. Sometimes you can get these coil formers on ebay too in quantities of about 100 per buy. 28 turns (7 turns per chamber) primary, C par. =56 pF. Secondary turn, if used, is 7 turns. Wire is 0.1 mm diameter enameled copper wire. I will try them and let you know. How much did it cost to make? I am looking for a couple portable rigs JUST like this. I am so excited I finally found something. Do you know of something like this that is for sale? the material is about 200,-€. The final transistors are round about 50,-, the two SSB filters 25,€ each, most of the rest of the stuff is from my junk box, so its value can only be estimated. I’d say 200€ is a reasonable caclculation. Unfortunately my rigs are not for sale, sorry to say.